The shiny silver quality of mylar called to my inner magpie. I knew it would be easy for me to get lost in making just aesthetic creations, so I tried really hard with my experiments to think about the functional quality of mylar and inflatables. For this experiment I made simple small circle shapes but thought about how it would act underneath a flat surface. It is easy to see how inflating can lift a surface upwards. However, in future interactions I think this would translate well with programmable air. I couldn’t get my hands on tubing to make this work how I wanted, but I would be really curious to see if blowing up each of the circles at different times could cause the board to move. I predict a sort of shimmy movement or it it remains stationary and just create diff surface levels. Underside of the flat surface. Still intrigued by the idea of movement, I loved looking at the inflatable gripping robots and wanted to experiment with mylar’s ability to curve. The first claw uses a technique similar to the example in class, using a long slender shape with tacts along the middle, however I made the tact lines really thin and close together. The “fingers” however, were too long and didn’t quite get the closure I was looking for. The second claw, has shorter fingers and the tact spread slightly further apart. This one has a much better closing look to it, but the “fingers” still don’t touch. It definitely wouldn’t be able to pick anything up. I think length matters a lot in terms of how the fingers will close and the way inner walls are constructed would make a big difference in how curved the mylar can form. I read up on mylar and learned that because of its reflective surface, mylar is often used to keep things cool. I wanted to test this by using the inflated mylar around a glass with an ice cube. Which would melt first? The inflatable lost air quite quickly, so I don’t think the mylar was really touching the glass enough to create true insulation, but the ice in the non mylar glass did appear to melt slightly faster. I recently watched an episode of Planet Earth, which featured a segment on parasitic fungi. I apologize for the graphic nature of such a choice and for the photograph depicted here, but it was just so fascinating to me I wanted to write about it. There exists many different types of fungi that pray on insects, infect their brains, kill them, and then grow out of their bodies. It is truly a horrific survival tactic, and almost so sci-fi it is hard to believe it exists in nature. The reason I think it would be interesting to transfer over to technology is because of the idea that it can spawn from any “shell”. When you think about it, this sort of exists in terms of softwares, which we can install into different machines. Or perhaps computer viruses emulate this biological example as well. However, what if we could do this with hardware as well. I’m imagining something a step further than something modular, that really emphasizes the emergent growth. Wouldn’t it be cool to have electronics that attach to different kinds of bases and self install/grow/learn/evolve? I’m not exactly how this would work or how to translate the tech from the bio-inspiration, but the fact that the fungi spreads by hijacking existing systems is really intriguing to me. It would nice to transfer it to technology with a more positive connotation. After presenting my midterm, I felt I was on the right track. I received positive feedback for the overall concept and aesthetic, but was encourage to take it further. In addition, I realized that the FFT() and getCentroid() functions I were using didn’t quite give me the accuracy I was looking for. Although it was suggested before to use ml5, I think I stayed away from it because I was too nervous to delve into another coding library. I stuck with what was familiar but I ended up applying the wrong tool to my task. Since the midterm my main focus has been transferring my current progress over to ml5 for improved accuracy. However, it almost feels like a step back because it took me a while just to understand ml5 and get the pitchDetection examples running (after starting a server, I can only run the pitchDetection examples in FireFox, no other browsers! grrr why??). Coding for me is a quite painstaking activity. It is kind of ironic that I’ve chosen a final project that is primarily coding-based, so it is slow going, but it is going. I wish I had more to show, but I feel good about my current understanding of ml5, the example pitchDetection programs, and how to modify them for what I want to do. When it’s a rainy day, visit Michael’s! BEESWAX: A soft material in that it is has a specific melting point. This version attracted me because it is in small pellets to later become a larger vat of material. UNICORN: This was a soft plastic material. Not rigid like a hard plastic, it had give to it and could be squished. Also hilarious that it’s called a unicorn but it has no horn. RUBBER STAMP: Rubber in general is a very malleable material, but at the same time it retains its shape really well. STAMP PAD: I was attracted to the ink pad as well as the stamp itself because it is essentially a sponge. I like the aspect of how it can retain a liquid, which could be interesting to explore further. CORD: Ropes and cords are very flexible. They can be manipulated themselves or used to manipulate other things. This one had a special glow in the dark property. WOODEN SNAKE: Although wood is not traditionally considered “soft”, it was interesting to see how altering it in this way, gives it articulation and flexibility like a soft material. PLAY DOH: An ultimate throwback for a soft material. Its squishy quality is the most attractive, but I always remember it drying out. I wonder how this will effect things. FOAM CREATURE: This form of foam was awesome to touch. It was very squishy and could hold shape briefly if you applied enough force. It was most fun to watch it slowly return to its original shape. BRUSHES: This attracted me as a soft material because its a collection of one thing (a bristle) to make a larger surface area. CHOCOLATE MOLDS: Literally soft robots! It is a silky textured plastic I think, kind of like a silicone. It retains shape, but has a floppy quality. My project is a music learning tool for singers. Inspired by the phenomenon of synesthesia, the project combines color with notes as a way to provide a visual to sound. For an untrained ear, one may not be able to hear if she is singing incorrectly, but perhaps she could more easily adjust if she sees it. I believe it is pretty entertaining. For the initial prototypes it certainly feels game like and participants become determined to see how their voice can change things. I think it is a good entry point to music learning because its simply exploring your own ability to listen to and produce sound. Technology. Briefly, how does it work? The project mainly uses the getCentroid function of FFT in p5 sound to identify pitch. A recording (with tuning tones) are analyzed and parsed for pitch. Live microphone input, to capture voice pitch, is analyzed the same way. Voice input is mapped in certain ways to give the user a better sense of what’s happening. PROTOTYPE 1: This first attempted tried to map pitch to the width or height of the voice circle. Meaning that a flat note would squish the circle making is squat and stretched horizontally. A sharp note would become tall and narrow. Thus, the user is meant to aim for a perfectly round circle. However, with all the ranges/bins of centroid values, it ends up producing more than 2 circles. This is confusing. My goal is to have one circle that’s static to represent the given pitch and an ever changing circle for voice input. PROTOTYPE 2: Gone away with mapping pitch to width and height of the ellipse, and instead, this version asks the user to match the diameter of their voice circle to the diameter of the pitch circle. This is most similar to my initial modular prototypes. I also added a “confidence” mapping. This links volume to voice input. The louder the user sings, they create a bolder color. PROTOTYPE 3: I still feel compelled to illustrate the nuances of pitch. So in this version, the circle travels vertically depending on whether the voice note is flat or sharp. This metaphor works well, I think, because you can think about producing sound as going below or above the target. Volume mapping is included in this version as well and as an exciting artifact, the color mixing for harmony is especially prominent. Although tones are associated with unique frequency values hertz…getting p5 to recognize them in the same way is almost impossible….in addition, something like the human voice, has way more idiosyncrasies than a computerized singular tone. Thus, my main battle is with noise. I tried different filtering techniques but still have a weird strobing effect that I don’t like. My next step is to really figure this out so that the aesthetics can be purer. I would like to continue building the interface to figure out the best way to help people learn to sing. This week we thought about mappings as a means to give the user more control. What aspects of music or music making could be controlled discreetly versus continuously? Should you map “one to one” or “one to many”? I’m still working on this project very modularly. My project as of now only receives input, so its hard for me to think of multiple mappings. However, I thought I’d try breaking the voice down further and map components of voice sound. Quick p5 sketch of the volume mapping. Singing more loudly produces bolder color! Played around with a MIDI keyboard from the ER for the first time ever this week. Hooked it up to Ableton! Very fun. Everything is really simple right now, partly because I’m learning as I go and I’m using what I know, but I also feel like the general design is quite simple. Is this a flaw? I want it to be super entry level, for now for the beginner user…but maybe this is boring. *I feel like these axis will move drastically depending on who uses my project, and I kind of like that. I’m just not sure how much of it is a natural outcome from the project or something I’m crafting. For example, a professional could make the sound quite expressive in the freeform version, but a beginner is using it to learn. I think it would be cool to play with more input somehow….perhaps volume or in a way “confidence” can be visualized as well. Here is where I’m getting a little stuck. So far I’m looking at the project as quite modular, but it would be cool to give the user more control over the sounds they can make. I’m not sure how to implement this….do I do it by visualizing more nuance of voice to encourage them to sing in different ways? Should it be physical controls on the application that alter sound? 1. Music Teaching Tools: Harmony. Make some music using the following: chord progressions, arpeggios, chords. Write a short response discussing your experience. I attempted some chord progressions a la “The Four Chords Song”. I don’t have very good rhythm andIi’m not sure if it’s correct but it was fun. Though I’m not very good at playing the chords, I definitely see how the melody aligns on top of them. Start thinking of interactions: what user actions will determine which musical outcomes? What aspects of the music will evolve independently of user actions (if any)? I started playing around with visuals to sort of illustrate the concept in my head. The program below changes position and color on the canvas according to mic input and FFT analysis. Then there are a few animations below of how colors/size could change according to notes. Moving forward: I really need to figure out if a computer is able to identify pitch from mic input. For this assignment, we dove right into VR, drawing in 3D based on a description written by one of our classmates. This January I went back to the Dominican Republic and I got the chance to visit my mother’s hometown, Enriquillo. It’s a small town in the southern region of the island. I hadn’t been back to Enriquillo since I was a little girl and it was wonderful to go back as an adult because I think I was able to appreciate it’s natural beauty even more. My mother has always told me stories about her childhood in Enriquillo. I felt like I was able to connect to those stories by physically being there. Her stories were often related to the ocean, which makes sense because the blue color of the beach in that area is so intense. One memory was of her as a small child sitting on the rocks below the cliffs that meet the shore. Although, they scared her, she would be mesmerized by the power of the waves. One day she waited too long to go back to the shore and the tide had risen up so much that she couldn’t swim back. So she had to scream out for help. Thankfully, she was heard by a neighbor who was able to help her reach the shore. That story always stuck out to me because it illustrated how the ocean is both majestic yet dangerous; it’s important to respect nature’s power. This was an awesome experience, though quite disorienting at times! It was most difficult for me to establish a ground, in both my drawing and for myself. I had to draw a tree to help me get a better sense of the space. It started to come together once Gilad showed me how I could change perspective and shrink/grow the canvas. Game changer. I wanted to capture both the serene calmness of the ocean that MaryAnn described, as well as its powerful brutality. I have been thinking a lot about this project this week. I think the challenge of designing a user path, rendered me a bit of artist’s block. My original intention, I’m realizing is more SOUND interaction verses MUSIC interaction. I still need to flesh this, but going over all the music education tools in class was quite inspiring. Aaron made a comment in class, that these tools don’t often encourage singing which is for many people an easier entry point. So I think I would like to make my target audience singing learners. At least for now. I’d like to continue exploring the idea of vocal input + data visualization. A tool that helps singers learn pitch by following the user path. Then perhaps after this tutorial, they can be encouraged to use it to make their own sounds/music/performance, which then more experienced music makers could enjoy as well. My vocalist friends declare this as a more introductory level choir piece. I think this could be a good place to start for easier harmonies and it is quite recognizable. Another recommendation from my classically trained friend. We like the color and texture of the different voices in combination. An example of stunning high notes, supported by the other vocalists. I like that it features an individual but still sounds whole only when there are many voices. Harmonies with more of a synth/techno sound. This could be an interesting option. Perhaps a user can harmonize with software sounds as opposed to other voices. A fun Jazz piece with vocal harmonies. I like the playfulness of the fast rhythm. I love when you can hear how a harmony builds. The simplicity of adding each part over the original voice is very satisfying. The human voice is a powerful instrument. I love how this completely instrumental piece with no lyrics of any kind transformed when sung by a group a cappella. Still working on this. I have never made music before and Ableton is quite overwhelming. I tried recording voice, but the volume is almost indiscernible! But ideally the path is a few individual notes, with pause for the user to repeat them, move to chords, then melodies. Since VR is often highly visual, we wanted to pair it down on what other elements or sense modalities make us feel present or immersed. The experiment invited participants to smell 6 different scent and listened to an accompanying sound, while blindfolded, inspired by a sort of wine tasting. Some pairings had more obvious correlation, others were purposefully contrasting. Kemi and I imagined that we work for Billie Eilish and her team. We created an installation with a supplementary mobil application. The installation features a large touch screen that with squares that highlight different aspects of Eilish’s music, emphasizing the implications of her sound. Touching the center would showcase the original sound, and moving outward to the corners breaks it down into components of what created that original sound. We also discussed having the user input their own sounds, either speaking or singing, and have our device modify it, almost like a filter, to sound like these parts of her music. 2. Write a project prompt for yourself. You will use it to frame subsequent assignments, but it can evolve/change later. Submit it here. Build a tool that allows one person to sound like many: I am thinking of a machine of some kind that would allow the user to sing into it and have the output harmonize with them, kind of like a one-man a cappella group. Design a visualization of sound: For this I imagine two possibilities. 1) In my collective play course we are using web sockets. I see this as an awesome opportunity to have multiple clients input to/modify a collective outcome. I imagine singing produces colorful fuzzball that combine and mix color based on harmony. 2) this could also serve as a teaching tool for singers perhaps displaying perfect pitch versus the users so they can learn how to match it. Create an installation that plays with the principles of acoustics: Not exactly sure what to do with this, and I’m not sure what its called, but some places are designed so if you stand in one part of a room you can actually hear what’s happening in a completely different part of the room. This week’s assignment was to get comfortable making hand router. I decided to essentially “sketch” with a power tool. I didn’t have an end result in mind, I just wanted to use some scrap wood, and experiment with the capabilities of the router and the circle jig. Watching how the tool was used in class to create many curves that can overlap reminded me of mazes of mandalas. I attempted to create a version of this. I nailed my piece of wood down to the large board in the shop (name?). In some respects this was one of the more difficult things, because I had trouble getting screws to go through both pieces of wood. 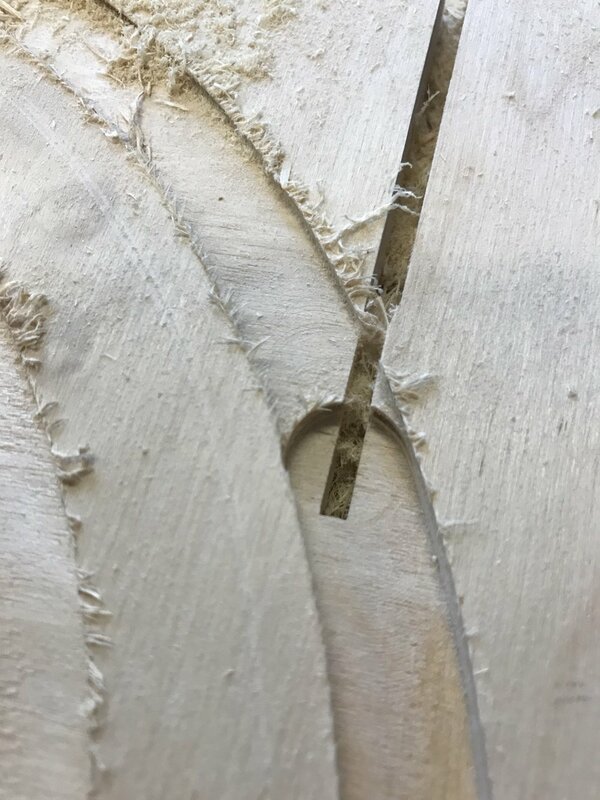 I left a lot of screw showing above the surface of my piece and decided to use two placed diagonally as their own jig or stop. This limited the range of the curves I could make. The initial moves were intimidating, as is any moment trying something new, but quickly it felt quite natural and it was exciting to have precision feel so easy. My goals were to play with depth of line and to cut a full circle out. The nail jig/stop method was both helpful and very annoying as I had to keep placing them in different positions if I wanted to create a full circle. This proved to be especially difficult cutting the full circle out. There is a small nick when the wood got away from me as it was breaking apart from its frame. I wonder if there is a good strategy for this? Overall, I really enjoyed the process, especially just letting my imagination run. This piece is definitely evidence of the transformative powers of sanding as well. Hard to believe it has already been half of a semester and this was my final project for Intro to Fabrication. It proved to be the most difficult one yet. The assignment was to mount a motor. Sounds easy, but we hadn’t even learned about operating DC motors yet in Physical Computing, so we were starting a bit in the dark. Obviously, since this is a fabrication course, the focus is on the physical and less on the computing aspect of the project, but a beautifully crafted container seems pointless if its contents don’t work. Thus, I was determined to learn about motors, get one running, and tie it all together with fabrication. This project really tested me, my time management, and my ability to improvise. It started off pretty rough, feeling like I hit a wall for inspiration. What was I going to make? I took apart a disc printer and other forgotten electronics from the junk shelf and ended up scavenging some motors! But it turned out that what I recovered were stepper motors, which seemed even more difficult to master in the weeks time. Finally the idea came when thinking about the motor as a way to make a sort of continuous animation. The real life draw() function if you will! Reflecting on the lack of sleep ITPers get, I decided to bring to life the idea of counting sheep to fall asleep. I was especially inspired by automata like this one, that turn circular motion by a crank into different types of kinetics. Sorry for the long introduction, here’s how I made a sheep jump over a fence. My first step was getting a motor running. Through a bunch of trial and error, an expensive trip to tinkersphere, and consultation with David Rios, I managed to hook up a dc motor to be powered only by an Arduino, and mapped to a potentiometer to control its speed. Upon David’s recommendation, I used a DC motor in a gear box to help slow the motor down. This was not only more suited for the movement I was looking for, but is also easier to mount! Yay, win win. While I had made some sketches of how I would make my automata, it was hard to envision it until I started prototyping and making some things out of cardboard. During this stage, I figured out what kinds of elements I would need like a sheep, circular panels, and a fence. I drew these elements from scratch in illustrator for future laser cutting. I knew that if I put a disc on an axel attached to the motor it would spin like wheel. If I attached a stick from the disc it would also spin but with a wider radius and this would be what makes it looking like a jumping sheep. However, figuring out how to put it all in one piece was the challenge. I made a janky cardboard prototype to hash things out. I knew I should have two walls to put the axel horizontally between and the the motor could be mounted to the wall. I knew I would need wood if I were to have any stability. Luckily I had been stashing good pieces of scrap wood for a later project and had a good amount of material to work with. I figured out that I essentially needed to create a box,it didn’t have to be fully enclosed, but it needed to be tall enough or have enough room below the axel to have the sheep swing through without touching anything. I laser cut a bunch of pieces, including the top of the “box”. While I prototyped with cardboard, I wanted to use of leftover acrylic for the sheep in order to try some other laser cutting techniques like engraving and the sharpie trick to color it! Acrylic would also be a little heavier which would help to slow down the movement. This stage of the process always seems likes its going to be the simplest. You’ve finally figured out your idea, you’ve cut all your pieces, how hard could it be to put it all together? Answer: extremely. My wood was wonky, I didn’t plan how I would adhere anything, etc. I managed to glue the wood pieces together and screw them for extra support. I drilled holes for the axel rod to go through, the motor shaft, as well as a weird nub on it. This way the gear box would lie flesh to the wall. In the process of testing my project, I ripped a lead off the motor. ABSOLUTE PANIC. But i figured out how to take a motor apart and replaced the leads for another pair from a different motor. Guess that trip to Tinkersphere wasn’t so bad after all (I bought backup motors for stupid things like this). If you ever destroy those flimsy leads off a motor, I GOTCHU. With things back under control, I focused on the main aspect of this project, mounting that motor! I had to drill out holes to be bigger to make sure the axel and the plastic nub had more room. Just like my table, I discovered that plumbing supplies are quite useful. My dad had some plumbers strapping lying around (thanks Dad! ), which is easily bendable. Voila! A homemade bracket! It took a long while to put the wheel and sheep onto the motored rod. It also took a whole lot of hot glue. But with persistence, I got everything running. With some final touches, like adding the fence, the sheep successfully jumps over the fence. There is definitely a lot I would do differently for this project. It felt very hap hazard the whole time, and I could have planned things out better. I would also like to make a version where the Arduino and breadboard could be enclosed. However, ultimately, I am quite proud of how it turned out. I combined a lot of skills I have learned throughout the course, and really learned how to improvise and adapt. It’s very exciting to make things work AND look fabulous. Cheers to a great course and hopefully getting my sleep back! Our assignment this week was to make something (anything) out of two different materials. The only constraint is that they could not be acrylic or plywood. 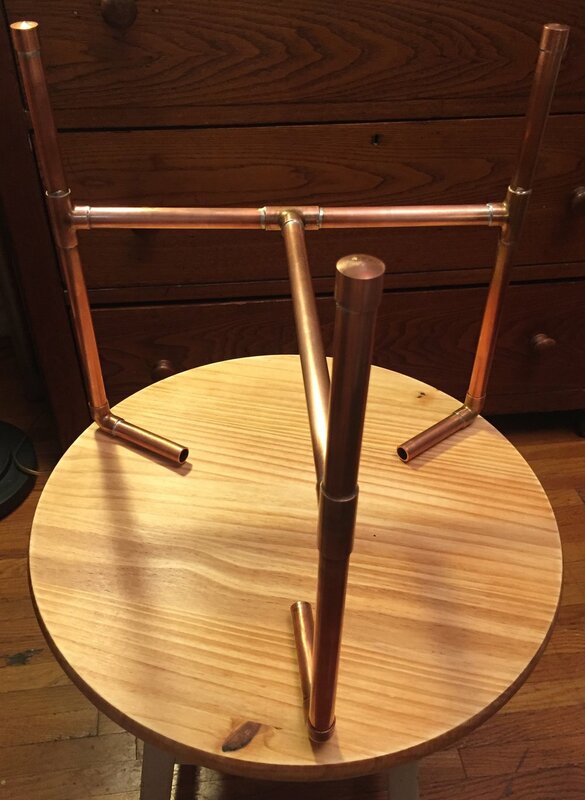 I chose pine wood and copper pipe as my two materials, and I decided to make a small table/stool. Laminated pine 17” in diameter round panel , 1” thick. I started by sketching out my design. I drew inspiration from different tables I saw online, and settled with a round table with three legs and a “T” shaped cross bar. Because copper pipe fittings only come in so many shapes, the design has certain constraints, and sort of fits together like a puzzle. prep pipe fittings for soldering by sandpapering the inside (creating a rough surface allows for a more secure adherence). Shellac helps to seal the wood. Pipe fitting pieces sanded and ready to go! Endcaps (left), Elbows (top right), Tee pieces (bottom right). I have been trying to work with a low budget for all of my fabrication projects so far, but sometimes it is important to invest in tools and materials that are truly meant for the job. Thus, even though I decided to use copper pipe unconventionally for this project, I wanted to make sure I used the proper tools and materials when cutting and fusing the pieces together. So instead of hoping for the best on the band saw in the shop, I bought an actual pipe cutter. This scores the pipe as you twist it around and little by little it cuts through. This is the cheapest pipe cutter I could find, so it definitely took time and a lot of muscle to cut my pieces. However, it is so much more precise than the band saw, it was totally worth it! I ended up saving copper pipe material too because I don’t lose as much material accounting for blade thickness. Pipe cutter scores the pipe evenly around the circumference. Revisited my original sketch to visually see the measurements and keep track of how many pieces I had cut. For the legs of the table, I had to calculate the height taking in consideration of the pipe fittings. They don’t just fit completely over the pipe, they are designed so that water can run through them, thus when fastened together there is about 1/2” space between them. I decided to have my lower leg section be 5” and the top section 7.5”. I took Ben’s advice seriously of trying not to use glues to fasten things. In plumbing, copper pipe is soldered to create super strong bonds. After all, the intended use of copper pipe is to be under pressure and wet. If this is how copper pipe is adhered together, it seemed like the most durable option. It was definitely new to me, but I was determined to try it. It’s just like soldering circuits on a larger scale right? I purchased flux and soldering wire specific to plumbing usage for the best results. And now it was time to set stuff on fire! Flux is so gooey and weird, I love it. Set up for the legs attaching to cross bar. Needed to make sure they were perpendicular and straight. For the final touches, it was important to me to find a way to attach the legs to the table surface also without glue. I chose to use brackets, which makes it secure but also possible to swap out the table surface in the future if I ever chose to do so. This was a really ambitious project, so I am proud that I completed it and that it looks as good as it does. It’s functional too! I spent way more money than I intended for all the materials and parts, which I’m not keen about, but the end result was worth the investment. I learned a lot of new techniques like soldering copper pipe and finishing wood. I love the contrast of the two materials. Yes, glue would have been easier, but using fasteners and soldering looks so better and is more durable. This week we had to make an enclosure for a physical computing project. In other words, an interactive box that could contain electrical components. While exploring the junk shelf, I found this speaker shell and it felt like fate. There are two sides that can be pulled apart making it a perfect enclosure because you can adjust the contents. I knew I wanted to use different colored LED bulbs, which could fit perfectly where the volume, treble, and bass dials used to go. My arduino kit came with an ultrasonic sensor, which kind of looks like two eyes, and thus I knew this would be a speaker no more, a robot was born. First thing I did was clean up the speakers and start figuring out where the components could go. There are certainly more buttons and dials I could add, but since I want bubble to work, I focused mainly on finding the best place for the ultrasonic sensor. I had to remove the middle peg at the top (pictured left, above) so that it would fit. The exisiting square cut out appeared to be a good place for an Arduino USB port (though I would have to make some adjustments/widen this hole). I also had to purchase smaller breadboards that could fit inside it. I find it helpful to make to do lists to organize my thoughts. This became a sort of living document as I would respond to each task with what can I do at home, what tools in the shop do I need, where do I get parts, etc. I had bought semi translucent acrylic for my laser cutting project, but didn’t end up using it. Since the LEDs look very small in the dial holes, I thought it would be sleeker to cover them up and have light shine through the acrylic. I knew the laser cutter would best accomplish this task. To get perfectly sized circles, I scanned the speaker directly, used illustrator to trace over the holes in the scanned image, and then laser cut the acrylic. The circle discs came out great. Not exactly sure how to seal them in there…maybe glue? Drilling was what I thought would be the easiest part of the whole project, but it took 5EVER. It was really hard to figure out how to place the holes and even more difficult setting it up so the drill press would actually go through the material. The drill bit I used was super short, and I had to stack the speaker onto of wood, and drill through the front side…which originally was harder to trace the sensor circles onto. Major thanks to John, because without him I wouldn’t have been able to get the proper size drill bit: the elusive and specific 5/8”. He also helped me drill out the circles even more when they didn’t quite fit the ultrasonic sensor. Initial small drill for test hole. Needed to change the set up dramatically when using the 5/8” bit. Tested 5/8” holes on wood. I say nibbling because that is the tool I initially thought would best help widen the pre existing port hole. However, I don’t think it was quite the right application…I couldn’t find one in the shop anyway. Ultimately, I widened the port hole WITH A FILE. Talk about tedious. This took quite some time, but it was effective. The Arduino was not fitting in as planned, so I became fearful of the robot enclosure actually working out. I filed a few things on the inside down to make room, but it was hard to remove the plastic knobs and elevations on the interior of these shells. I decided to move on to painting it for the look I wanted. Electronics fitting inside would just have to be continued later. It was a really hard decision figuring out what color to make the robot. I decided to try this spray paint that’s suppose to give a granite looking effect. I thought that would be a fun way to add texture to the robot and play with the look of different materials. Was kind of expensive…but hoping for the best. It ended up looking kind of weathered. It reminds me of Wall E.
This took a lot of fanagaling. After a panic ridden day worrying about whether smaller breadboards would arrive, USPS did pull through and they arrived at 8pm. Not ideal. To get everything to fit I had to but the breadboard and Arduino back to back and essentially stack it. I attached the LEDs to the breadboard itself and in the order I wanted so I could just place them into the dial holes. It’s pretty wonky, but it does work! My biggest piece of advice is to try to test if its working in multiple stages a long the way. My idea was to use a sensor that measures distance, trigger LED lights depending on how close or far one is to the sensor. While assembling, I tested to make sure each LED would light, and then again to make sure the Ultrasonic sensor triggered them. For my info about the code and wiring of this sensor LED interaction, check out my PComp post. Finally all assembled, everything works. The robot can “see” an object in front of it and senses its distance. BubbL doesn’t like it if you’re too close to it. A green light indicates a good distance, yellow is neutral, red is too close - you’re bursting its bubble! I am most proud that I was able to use a found object and turn it into my enclosure. However, it is definitely difficult making components fit inside a preexisting container. I wonder what it would be like to do the opposite and build the enclosure around the components. This week felt the most daunting thus far, but ultimately, I became really inspired by it. It’s awesome to see how an enclosure can really transform a project. While BubbL’s core is simply one sensor, some light bulbs, and computer code, when contained inside the speaker it takes on a new form and becomes a character with personality. I’m excited to expand on BubbL’s capabilities or make other found object robots in the future! I was super excited to get started on this project because I’ve actually had this idea in mind for a while but didn’t quite know the best way to execute it. Lo and behold, acrylic and the laser cutter happened to be the perfect material and tool. As they say, diamonds are a girl’s best friend...but ain’t nobody got the monies for that. I knew I wanted to make ”diamond” earrings - a 2D graphic rendering of a diamond. So it’s a lil punny. I try to be clever. With an extra time constraint this week because I would be out of town for a wedding over the weekend, I chose to do something simple that I felt would be a good intro to the laser cutter and actually achievable. I knew I wanted to use acrylic for this. A plastic would give stability and emulate the shiny quality of a diamond. I took a field trip to Canal Plastics - what an amazing store. I definitely had a magpie moment like let me buy all of the shiny, but I controlled myself and chose a white acrylic at 1/16” thickness because it would 1) pop against the skin 2) was thin enough to eventually stick wire clasps through, 3) was the cheapest. For my first time ever using the laser cutter I didn’t think it would be wise to buy expensive material. Fortunately, I had some earring hooks at home. All set to go! I drew out on paper a quick sketch, but since the laser cutter only uses Adobe Illustrator files, the final design would have to be computerized. This was by far my biggest challenge, because although proficient in Photoshop and other Adobe softwares, I don’t know Illustrator at all. It was just as difficult as I expected! I thought my diamond shape was relatively straight forward, but it took HOURS. Especially turning it into an outline and making sure everything was symmetrical. If any one knows good Illustrator tutorials or tricks, hit me up. Now for the fun but also most intimidating part. I found some unclaimed scrap acrylic in the shop to use for my test runs. My white acrylic was sacred. SOMEONE LEFT THE SHINIEST MOST BEAUTIFUL HOLOGRAPHIC ACRYLIC....which I did not even successful cut through. More on that later. It took many many tests to figure out the right settings for the laser cutter AND my design. The scrap material was much thicker than what I would be using, but I figured if I learned how the printer would react to 1/8” acrylic then it would actually be easier to cut my material. I used the 75 watt laser. I prepared my illustrator file on the connected laptop and focused the laser for the iridescent acrylic I found. (which is like playing game, moving the bed closer to the laser) The first round, the cutter was set to 30s 100 power...as suggested by a helpful shop worker. For acrylic the ideal setting was actually 3s, 100 power. So this obviously did not cut through. Even after running the job several times (cutting over and over through the same lines). Wishful thinking that my diamonds would come out perfectly on the pretty holographic acrylic on the first try. For the next few tries, I kept knocking the speed setting down closer to the ideal. It honestly did not cut until it was set to the exact ideal setting. However, I can see why shop friend suggested the higher speed. At a lower speed, the laser did finally cut through the acrylic but it also burned it and sparked uncomfortably. My finger was hovering over the stop button and I was trying not to panic that I would destroy the laser cutter and burn down ITP on my very first project. ALAS, all was fine, and settings duly noted. I redesigned the diamonds into two new files, one with thicker lines, and another with even thicker lines. I cut both of my new files to test which thickness of lines I liked best. With a few more adjustments (reduced the thickness of the top horizontal line and the size of the hole where the hook would attach), I finally liked the look of everything and the lines were thick enough that it would be sturdy. Opening my fresh white opaque acrylic, I popped it in the laser cutter and set it to 10s and 100power, upping the speed because this material was half as thick as my test runs. It cut beautifully! Success. I removed the paper backing, probably the most satisfying part and was ready to assemble the earrings. My aunt taught me some basics about jewelry making this summer, so I already knew how to attach the hooks. I used pre-made metal hooks for a bit of a short cut here. Note to self: buy actual jeweler’s pliers to work with intricately with wires without damaging them. The final product is actually wearable earrings! I love how they turned out. I kinda want to expand on the idea and do a whole gem earrings series. Would you wear these? Let me know what you think! For this assignment we needed to make 5 of the same thing, focusing on repeatability. How can you assembly line a process? What tools can be used to help you repeat a process over and over again. The project had to be multi-processed, not just pressing print 5 copies on the laser cutter or 5D printer. After much back and forth on what to make , I decided on wooden dice. I wanted to challenge myself to work with the power tools in the shop and a material that could not be as easily molded by hand, like wire. And there would certainly be many steps to their creation. Dice have been used since before recorded history, and are one of our earliest gaming implements known to man. The oldest known dice date from 2800-2500 B.C.E and were excavated from an an archeological site in south-eastern Iran as part of a backgammon like game (Wikipedia). The precursors of dice were often marked animal bones with “magical properties” used to cast fortunes of the future. The mathematical connections were not attached to dice until the 16th century when the concepts of randomness and probability were conceived (Britannica ). Although there are many forms of dice nowadays, different shapes, loaded, etc. the typical 6 sides cube is labeled with numbers 1-6. And if you didn’t know, each face and its opposite always add up to 7! I’ve set a guideline for myself: no purchasing of any material – only use scrap wood. Use a drill, or if possible a dremel with a circular head? (ask in shop) to create the dots. Ideally I would like them to look like dimples more than holes, which is why I’d like to know what tool could accomplish that. As planned, I secured wood from the scrap pile! For a better aesthetic, I looked for solid pieces of wood instead of ply. Note: none of these scrap pieces were very long, which made my quest for precision even more difficult, because I barely had any room for error. The first thing I did was figure out a good size to make the dice based on the pieces of wood I found. 1.5” square seemed to work. I started by cutting a board roughly in half lengthwise with the band saw. Ben already told us this wasn’t very accurate, so I left room in case I couldn’t make a straight line. Then I went totally power sander crazy. With no guidelines, I just kept sanding like YAY EVERYTHING IS SMOOTH. So I ended up with two very smooth but very wonky blocks. Alas, as most things are in creating, it doesn’t go perfectly the first time around. I tried again, using penciled lines carefully measured. This allowed me to sand with a guideline instead of depleting material recklessly. The final square face would be 1 3/8” square. Next, I needed to chop the long pieces into cubes. Since the band saw, is not very precise, I knew I should use the chop saw. I measured out my long pieces to be chopped with a fine pencil line separating each. John made me rethink this because the chop saw blade is 1/4”. Measuring each cube needed to account for this loss of material. John helped me cut five “equal” cubes. After this I wanted to make some sort of jig to place the dots perfectly on each face of the cube. I saw this as a good opportunity to use some things we were learning in ICM. I wrote a simple program to create 3 x 3 grid of 9 equally placed dots. From these nine, I could make all the different dice patterns. It took me a white to figure out how to pt the dots on the cube. Aesthetically, I wanted them to be dimples more than holes. So I tried using a dremel with a stone bit. Although, I liked it (even when it burned the wood), I knew drilling each dot by hand would be difficult. Drill press and mighty clamp. Dot stencil ”jig” placed over each cube. Drawn dots. Matched to make sure each opposite face add up to 7. Rough dice, rough dots, rough table surface. I opted for the drill press instead to create more exact holes. Ideally, my jig would be able to hold the cube solidly in place and in line with where ever a dot would need to be drilled, but since there are a few patterns, this potentially meant several jigs. Ultimately, I used the clamps at the drill press as a sort of jig to hold dice position and my dot code as a paper stencil. For example, patterns 1, 3, and 5 all contain 1 dot in the center. I could leave the clamp in “same position” for all the centers of all 5 dice. HOWEVER, and it’s a big however. These are far from perfect cubes. While this would have worked in concept, it did not work in practice, and I had to move the clamp almost every drill to line up the dice in the proper position (using my stenciled holes drawn on each dice as a guide). 105 dots in total! To finish up, I gave them a nice sand. In the future, I might paint the dots a nice brown (inspired by my accidental wood burning) and maybe wax them to bring out the grain. Though far from perfect or precise, I am proud of what I made for this assignment. I chose dice for the opportunity to learn the power tools in the shop and work with wood. Two goals that I accomplished. I practice using the band saw, power sander, chop saw, and drill press. My big lesson learned is not to rush. Especially during dot making, I started getting frustrated it was taking so long. There are a few holes that frayed because of my impatience, and thus it doesn’t look as polished as if I just gave over a few extra seconds to do it right. I don’t know if I’d make dice again, but I know some good techniques to apply for other projects. Now, let’s go play Yahtzee! At ITP we have to document everything, so I have been using the blog itself as my medium to hash out ideas. From beginning to end of this post, you will see how my ideas evolved. I needed to know exactly how a flashlight works or I wouldn’t have a chance of making one. In addition, a few ideas design wise: I kinda liked the portability of my USB drive and its pinwheel cover effect. Maybe I’d model it after real fire emitting tools ex: lighter, match .... after some research, could I put the electronic components in the actual lighter body?? A quick google search led me to this diagram which explains how a flashlight works. It boils down to a simple circuit: A light bulb of some kind, batteries, wire, and a switch/button (can throw in a resistor in there too if we want to control voltage). How to proceed? I'm thought I should try making the circuit first and then figure out what to put it into. I made a simple circuit with 2 AA batteries taped together, a white LED, and copper wire. My finger acts as the switch, turning the light on when pressure is applied. For the second round: I added a switch (small Arduino button) to control when the light goes on or off. In the future, I’d like to look into switches that hold this position, so that the user does not have to constantly hold the button for light. After having the circuitry figured out, the next step is to encase it into some sort of shell. Although I felt pretty married to the idea of putting it in a lighter, using two batteries forced me to abandon that idea. I would need something long and slender instead. That’s when I thought a highlighter or Expo marker would work well. It’s the right width to hold batteries and the LED could fit where the felt tip would be. But what would creation be without the unexpected. After removing the insides of the marker, the batters fit perfectly in diameter but were too long and stuck out at the end. Determined to use the marker as the shell, my plan is to extend it out at the bottom. I’ll use another marker shell to increase the length. My biggest issue so far was figuring out how to include the switch. Ideally the switch would be encased as well with only the button exposed for the user. However, the batteries fit too snugly that there is no room for the switch. I started by drilling a hole, until realizing the whole square base of the button will have to come out from the shell. Using an icepick and my gas stove, I heated the icepick to melt the plastic, creating more of a square hole for the button. Using the band saw in the shop, I cut the bottom portion of another marker to extend the container. This proved to be my easiest task, because the true assemblage took many tries. Since I’ve only tried soldering a few times before, I definitely wasn’t skilled enough to complete the detailed work I was looking for. In addition, wires kept breaking. I thought maybe assembling it outside of the container first and then putting it inside would work, but that was also a flop. Eventually I got it light using copper tape and funny curls to make electric connections. This was a seemingly simple task that proud to be very challenging for me. My biggest pitfall was just fighting my perfectionism. It doesn’t look as nice as I want it to look, and I know there are many ways to improve the actual electronic mechanisms. I understand very generally how the circuit is working, but would love to delve further. Overall, I’m proud that it lights up and resembles pretty closely to my design. Now…off to pray to the ITP and Circuitry Gods that it’ll work for class tomorrow!